FDM is pioneering the use of 3D printing to produce made-to-measure insoles for the NHS and has secured an £860,000 investment from The North West Fund for Venture Capital and Lancashire Rosebud Fund. Using the system being developed by FDM Digital Solutions, hospitals will be able to scan a patient’s foot shape and email it to the company, which will then print and deliver insoles to the exact specification within as little s 48 hours. The process will replace the traditional hand-made techniques and could revolutionise the way the NHS buys orthotics and other products. FDM, together with its partners East Lancashire Hospitals NHS Trust and the University of Salford, have already won grants totalling almost £1m from the Technology Strategy Board and EPSRC to help them develop the supply chain. This latest funding will enable the company to invest in the latest 3D technology to allow it to fulfil future orders. Using 3D printing or additive layer manufacturing (ALM) as it is also known as objects are created layer by layer to replicate an exact design. In addition to its work in the medical sector, FDM Digital manufactures components for the aerospace, engineering, automotive and motor sports industries. Using 3D printing objects are created layer by layer to replicate an exact design using CAD. In addition to its work in the medical sector, FDM Digital manufactures prototypes, jigs, fixtures and end use parts for industries such as aerospace, engineering, automotive and motor sports using soluble core technology. It also offers 3D scanning and reverse engineering services. 3D PRINTING IS A DISRUPTIVE TECHNOLOGY WITH HUGE POTENTIAL THAT COULD REVOLUTIONISE MANY INDUSTRIES. The company was established in 2011 by Graeme Bond, who has over 10 years’ experience of 3D print techniques. Lancashire County Council Rosebud Fund has provided £172,000 while The North West Fund for Venture Capital has invested £688,000. both funds are managed by Enterprise Ventures. The North West Fund for Venture Capital is part of The North West Fund and is financed jointly by the European Regional Development Fund and the European Investment Bank. 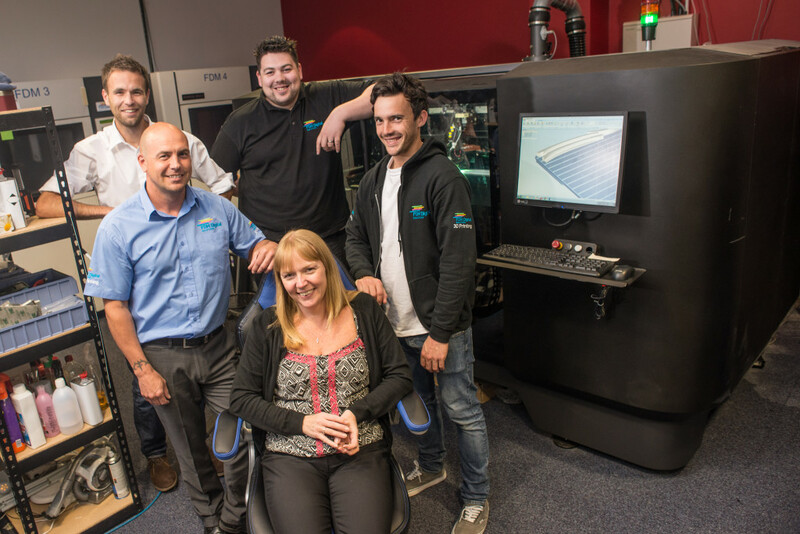 3D printing could transform supply chains in the NHS and other industries and FDM Digital Solutions hopes to become the leading centre of excellence for this new technology in the North West. Doug Stellman of Enterprise Ventures said: 3D printing allows a radically different approach to manufacturing as can be seen from the healthy order flow being generated from their existing customer base. The technology that FDM is now proposing for orthotics allows the shape and properties of the materials be varied to match the patient’s exact needs, as well as pioneering a new lean supply chain model which can be applied throughout the NHS. County Councillor Niki Penney, Chair of Lancashire County Developments Limited (LCDL) the county council’s economic development company, said: “Through Rosebud, we are encouraging innovative companies to grow and develop. There’s great potential for 21st century technology, such as 3D Printing, to create new jobs in exciting new fields of work.